What can be happier than sprinkles? It’s really hard to be grumpy when you have sprinkles on your cake. I was recently asked to make a smaller version of this cake from Something Turquoise for a birthday. I’m not nearly as good a photographer as Christa Taylor Photography is, but here are some of my shots of the process. Did you know you can buy sprinkles by the pound? 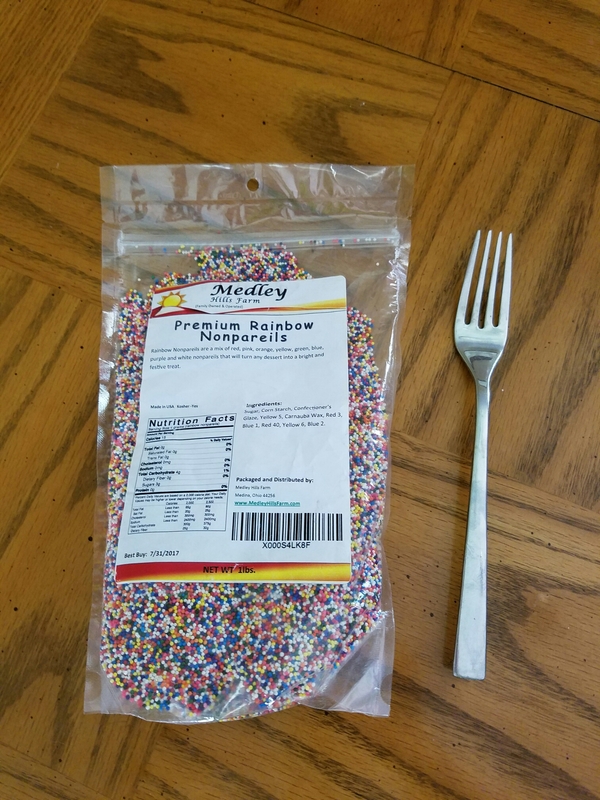 I figured buying a gazillion little containers of sprinkles would be pricey, so I bought a whole pound from Amazon. It’s about 2 cups of cheerfulness. 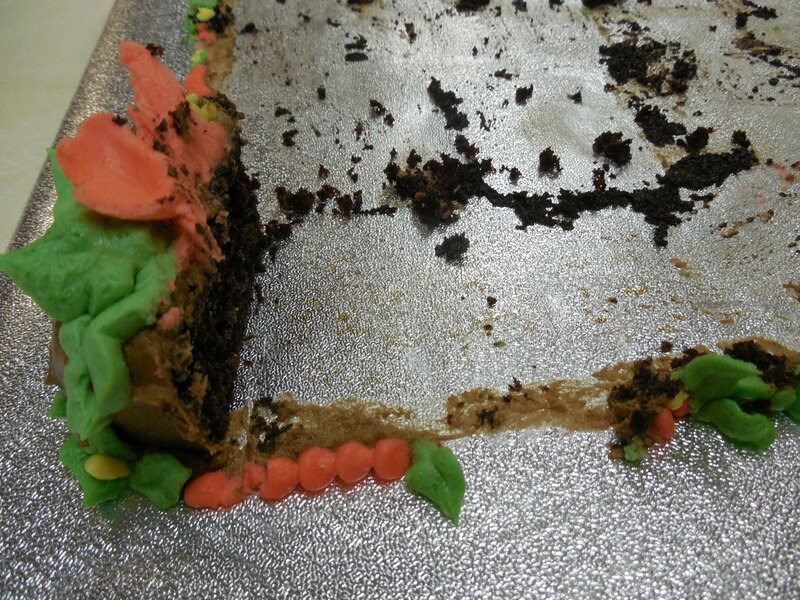 It was a two tier cake, and each tier had 3 layers. The bottom was 9″ in diameter, and the top was 6″ in diameter. 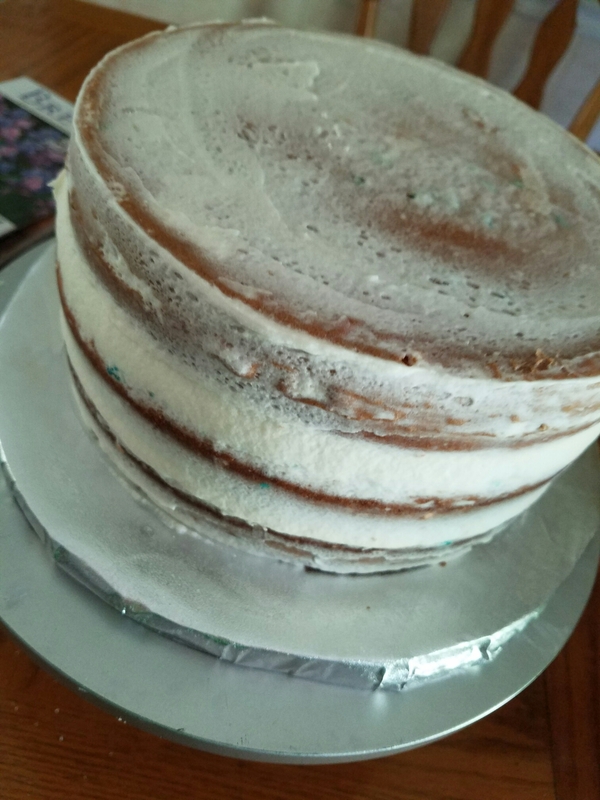 I used a total of 4 batches of buttercream to crumb coat and frost the cake. 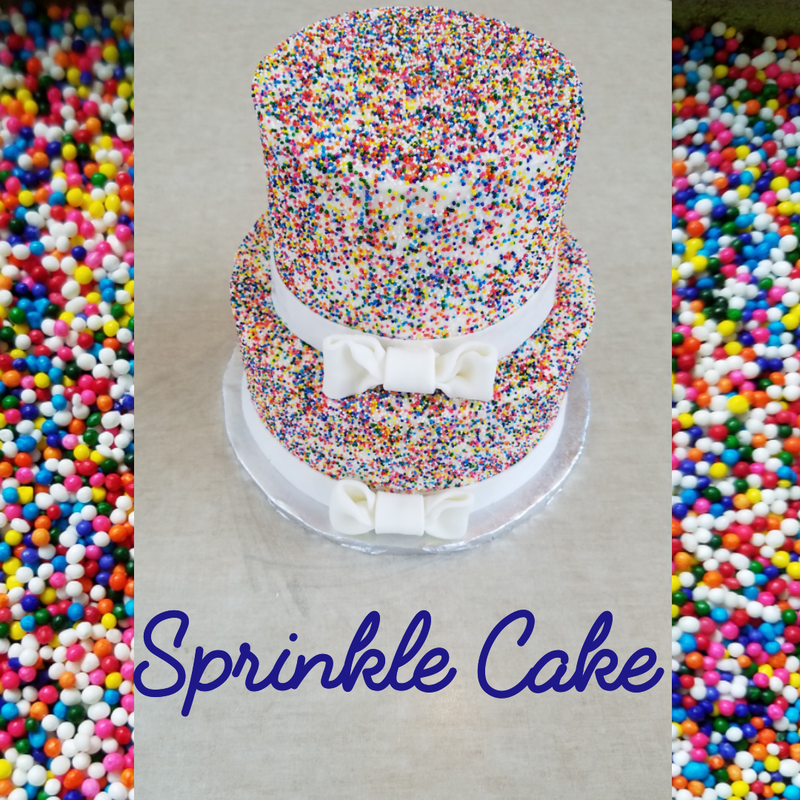 There are various ideas floating around about how to apply the sprinkles. Some roll the cake in the sprinkles, some use parchment paper and press the sprinkles into the frosting, but I went a different route. 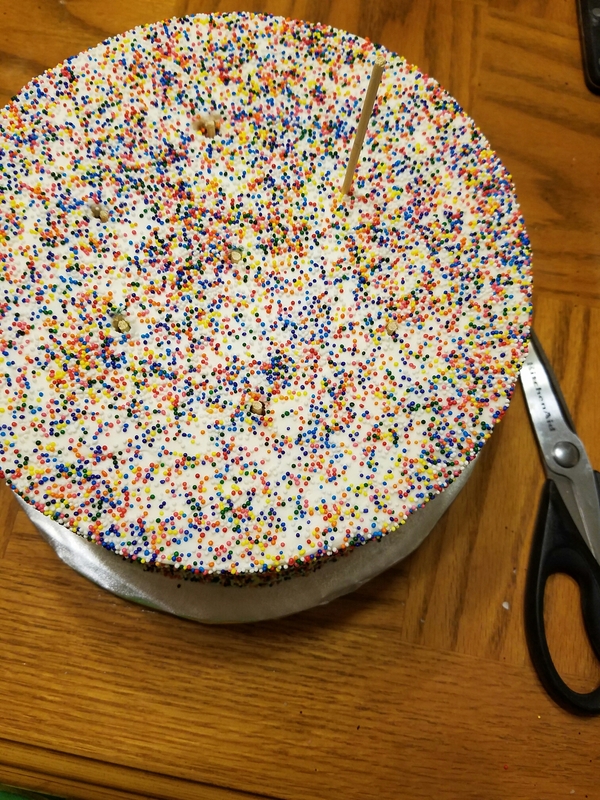 I reasoned that those little nonpareils would stick to freshly applied frosting if I just kinda sprinkled them on the cake. 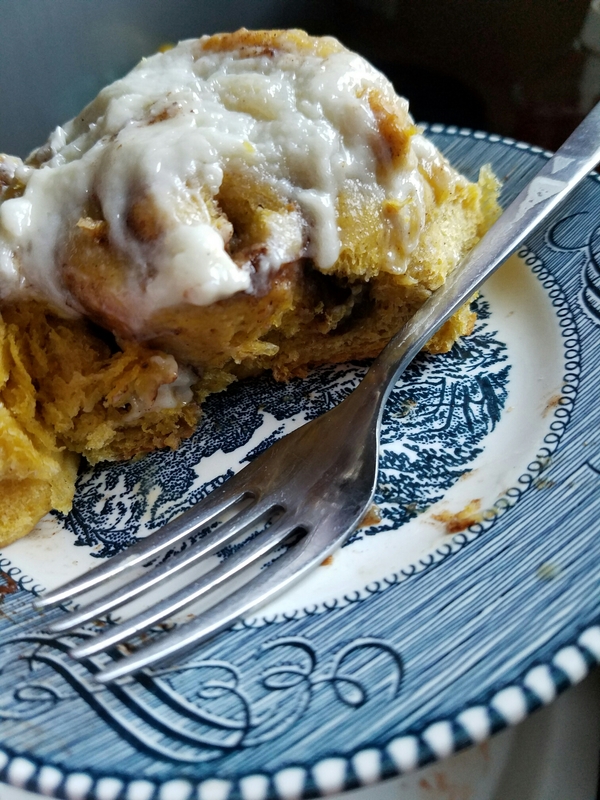 I tested my theory on a swatch of frosting smeared on a plate, and off I went. 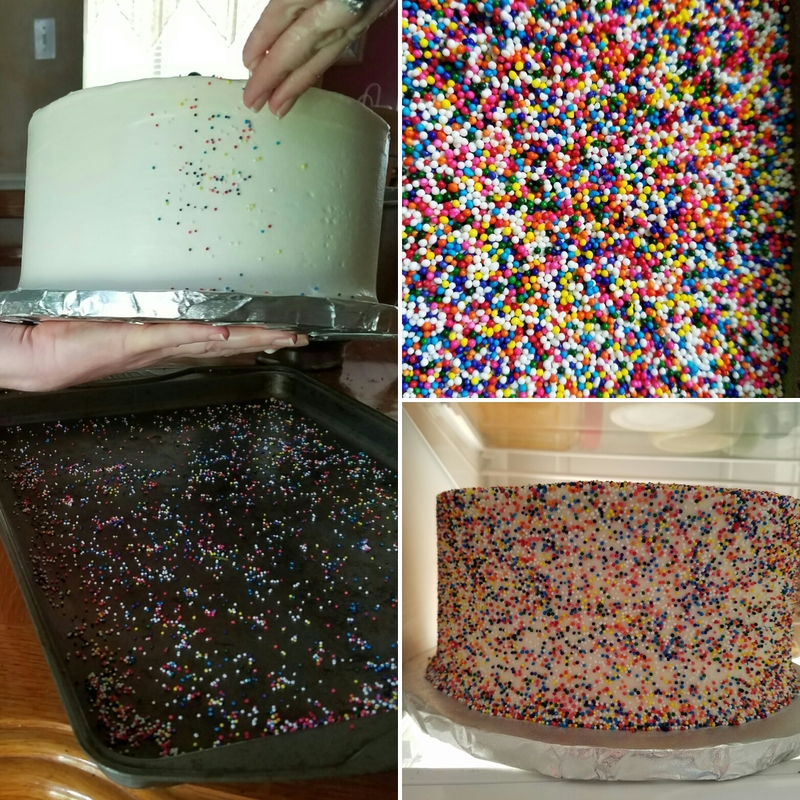 After the final coat of buttercream, I took the cake, tilted it over a cookie sheet, and sprinkled the sprinkles over the sides first. I sprinkled the tops last. 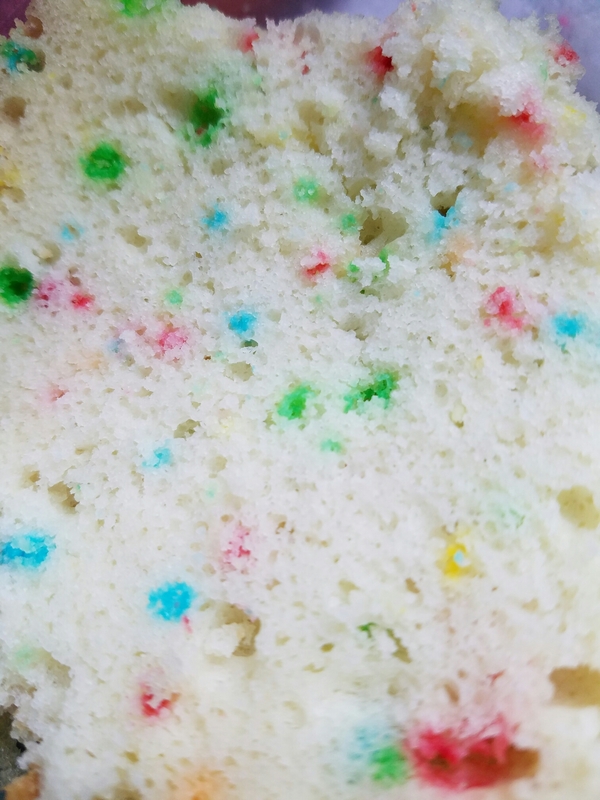 I used about a cup of sprinkles for the whole cake. 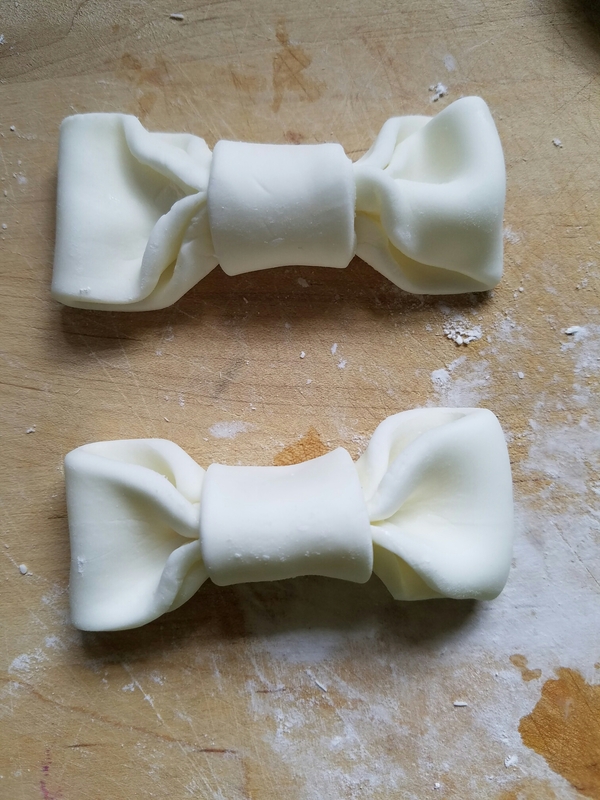 I made the marshmallow fondant bows ahead of time so they could dry. Fondant is like Play-doh for grown-ups. 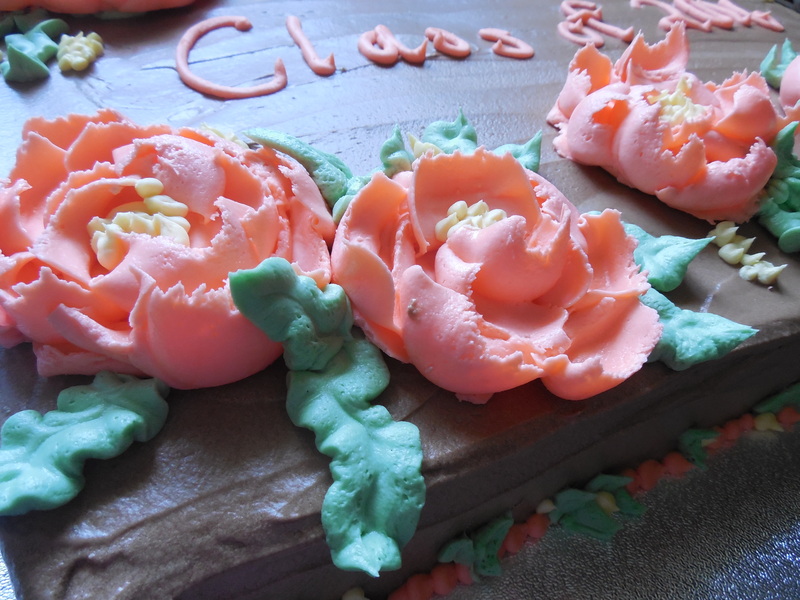 People don’t usually even eat the fondant, so maybe bakers should just switch to Play-doh. It is non-toxic, isn’t it?? I used wooden skewers in the bottom tier to support the top tier, glued the tiers together with a little soft frosting, and kept it refrigerated. I also put a skewer through both tiers to help prevent shifting during delivery. Driving with a cake is the most nerve-wracking part of the whole cake business, in my opinion. Always carry an emergency kit! The fondant ribbon was added just before delivery. If you refrigerate fondant, it tends to “sweat,” or get shiny with condensation. A little frosting “glue” to hold the bows on after delivery, and it was done! What do you think? Who do you know that would love a cake like this? If you’ve been following my blog recently, you know I recently got a very nice set of Russian piping tips. In my previous post, I shared some advice for using them, but here I’ll break down decorating that cake and tell you about the colors. 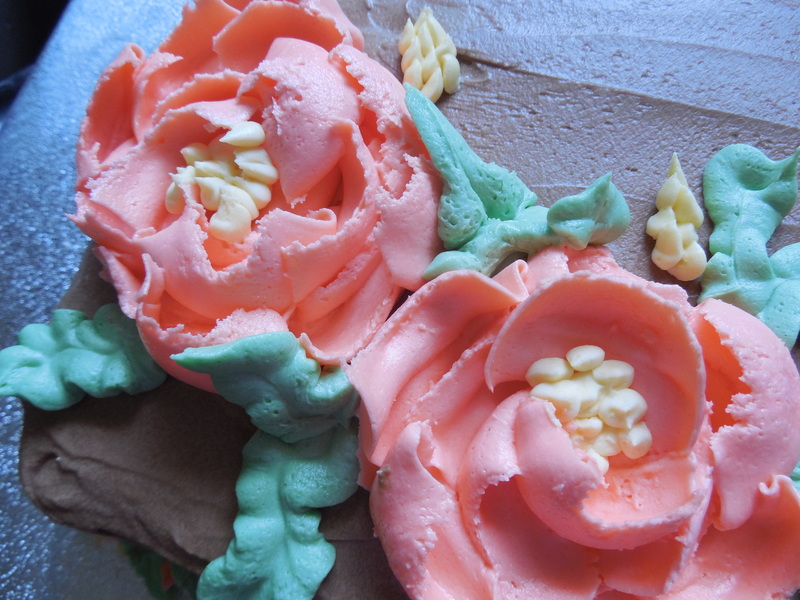 I decided to use shades of coral for this cake; I thought it would look nice against the brown mocha frosting. 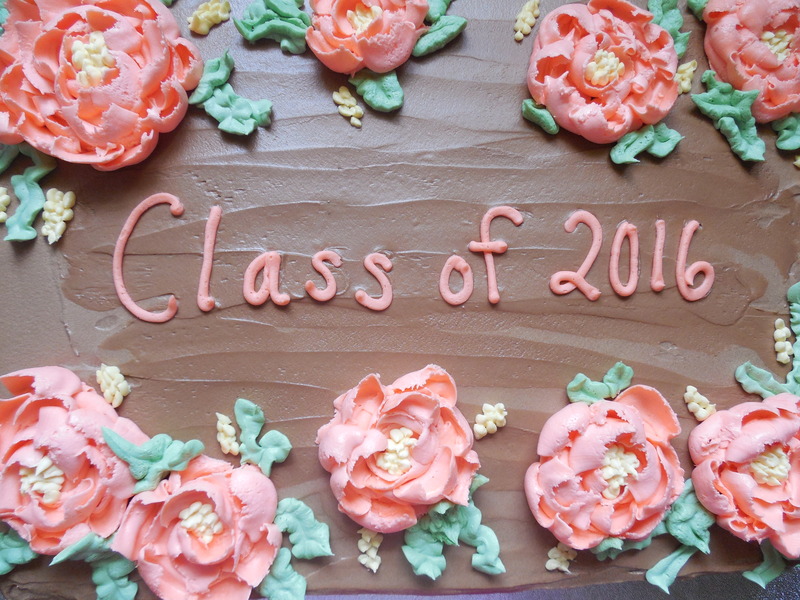 I did a graduation cake with coral peonies recently, and I loved the coral against the mocha. I started with a bit of No-Taste Red and Golden Yellow and made the lightest colored flowers first, using a tulip tip. Then I darkened it a bit with more colors, and used the rose tip. Not sure what to call this last tip. Maybe another tulip? It makes pretty flowers though! A Wilton tip #352 with some Moss Green color finished out the design. Those leaves are such a wonderful finishing touch! Love them! Do you have any Russian piping tips yet? 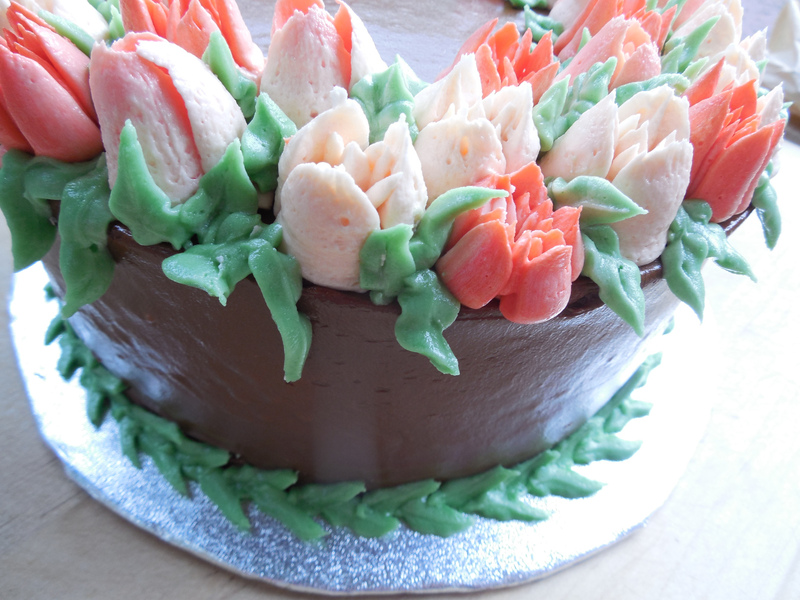 If you like to decorate cakes with flowers, they will totally change how you decorate a cake. 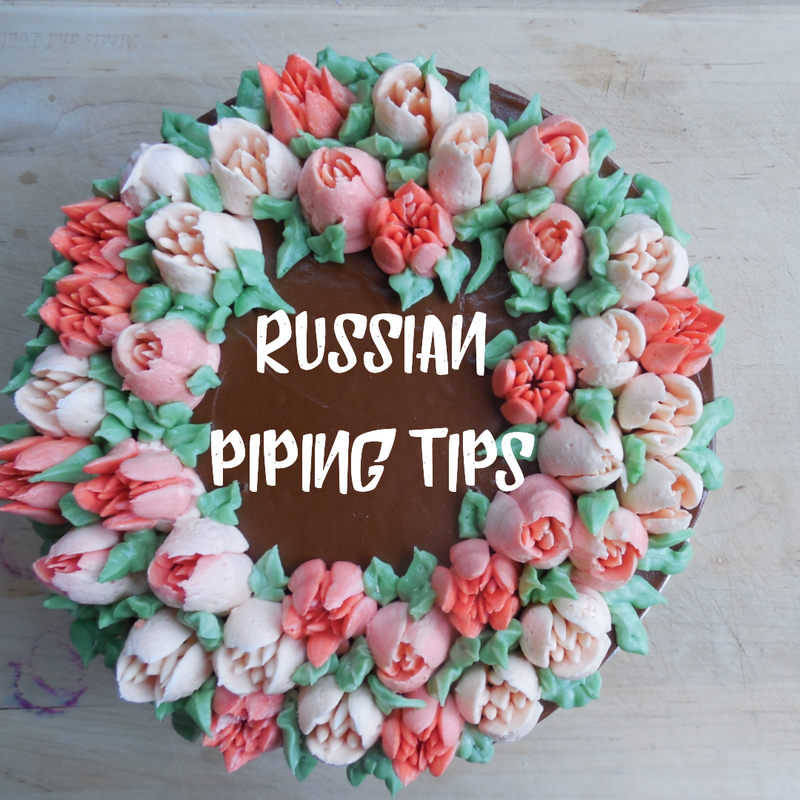 If you’re new to the Russian piping tips, be sure to check out my 5 tips for using them! What do you think of the cake? Any more color scheme ideas for chocolate or mocha frosting? Maybe I should try white and pale green next time? Tell me what you think, I’d love to hear your ideas! I love the ease and flavor of homemade jam. Peaches are in season now, and I scored an incredible deal for 75 lbs of peaches. I have canned some slices, canned peach jam, frozen peach slices, but my latest peach project has been a layered peach-raspberry jam, or peach melba jam. 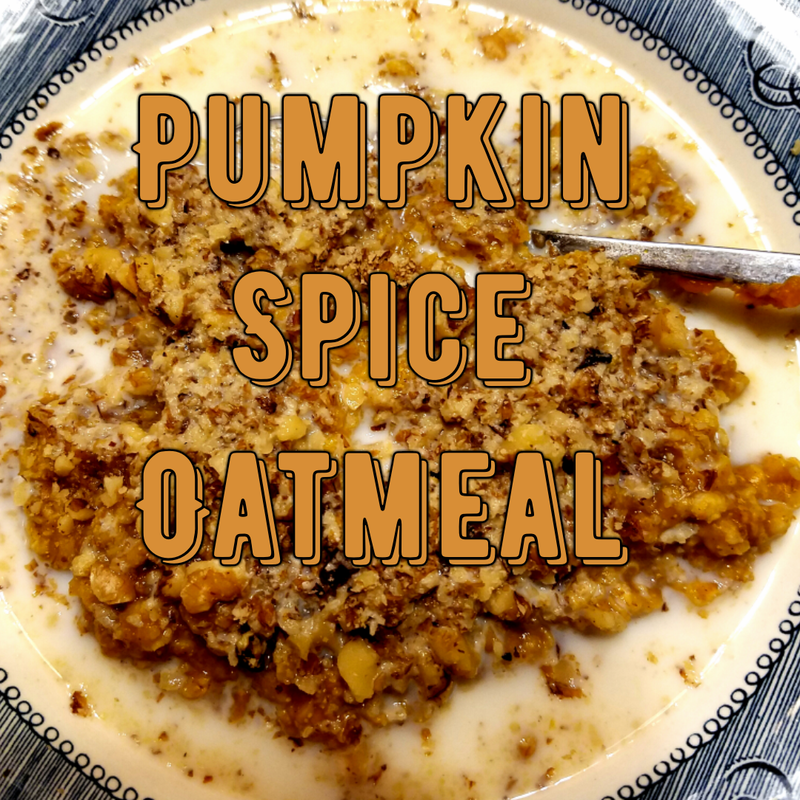 The recipe I saw in the Ball Book calls for them to be combined, but I decided to play with the recipe a bit, split the two jams, and see what happened. That’s pretty much what I do with most recipes. Anybody else use perfectly nice recipes as a springboard for what you want to make? This layered version is a bit involved, but the visual effect is worth it. Well, I think so anyway. It is a bit time consuming, I have to warn you. 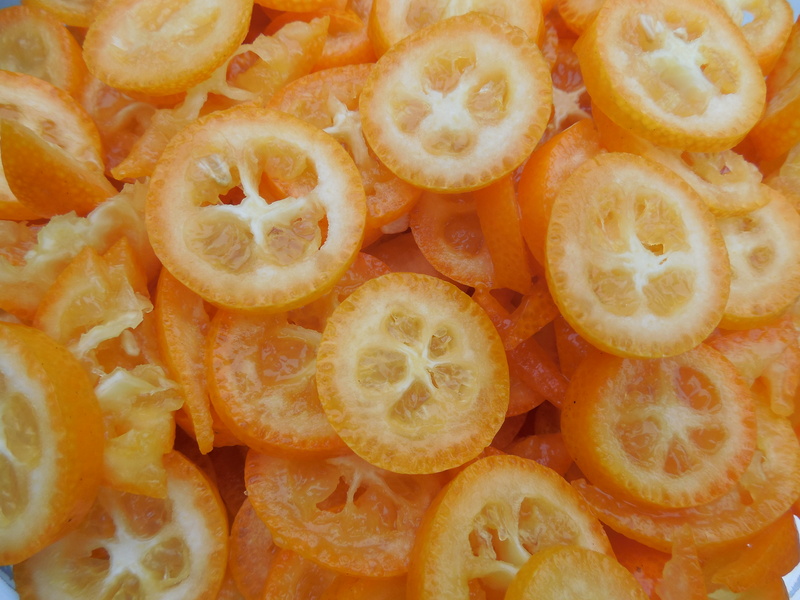 Start by prepping the fruit. Peeling the peaches is the most time-consuming part of the whole process. 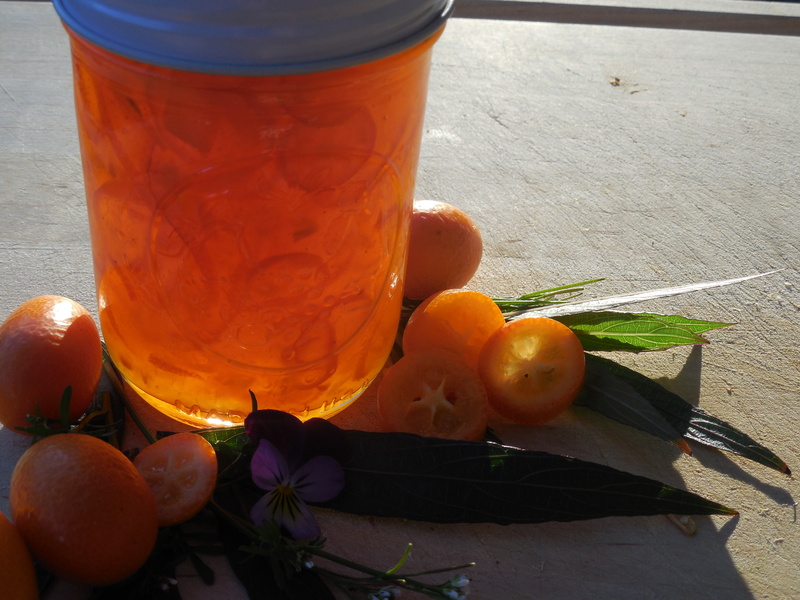 Wash the jars and put in the hot canner. I chose to make the raspberry jam first because I though it would look better that way and I figured it would be denser and more likely to stay in a layer at the bottom. Crush the raspberries or give them a quick whirl in a food processor. Measure 1/2 cup of sugar for the raspberry jam. Whisk 1 tablespoon of the pectin and 2 tablespoons of the sugar together, then into the raspberries. Heat to a rolling boil, stirring constantly, then add the rest of the reserved 1/2 cup. Heat to a boil again, stirring constantly, then boil for 1 minute. Remove from heat, and carefully put 1/4 cup of the raspberry jam into each of 6 jars. You could of course make the layers thinner and put some in all 9 jars. Totally up to you. Now it’s time to make the peach jam. 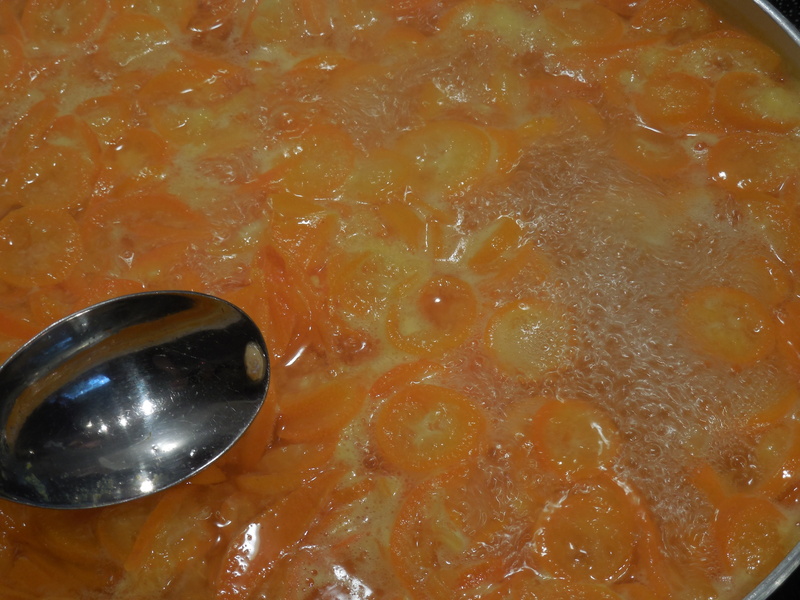 Whisk the remaining pectin into 1/4 cup of the remaining sugar, then heat the peaches and the sugar/pectin mixture to a rolling boil. Add the rest of the sugar and heat to boiling again, stirring constantly. 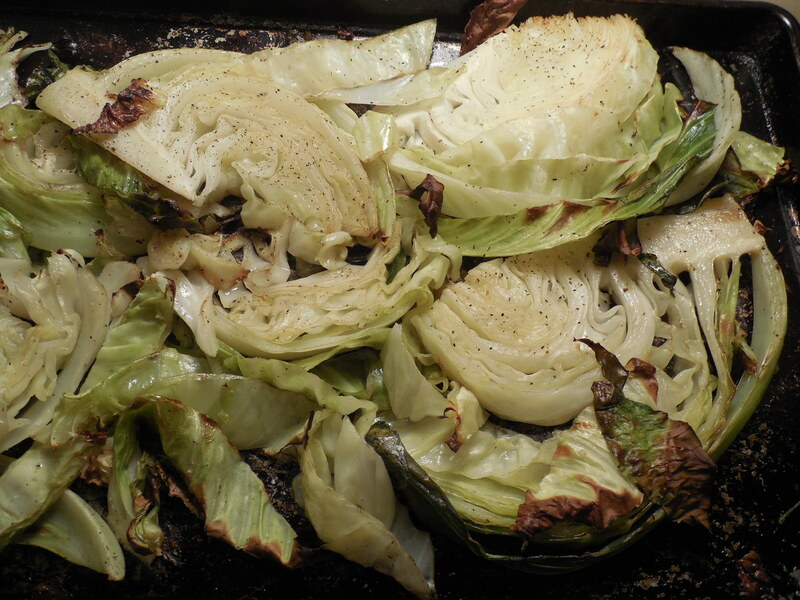 Boil for one minute, then turn off heat and remove pot from heat. I like to live dangerously, so I just used what was left in the packet of pectin, rather than a whole other packet, which was risky. It worked for me, and the jam set nicely, but you may want to use a whole packet. Carefully ladle the peach jam into the jars, leaving 1/4 inch headspace. Top with warmed lids and screw on rings gently. Process half pints for 10 minutes. I love the look of a layered jam! I’m wondering if I should have put the raspberry on top, but it’s too late now. Maybe if I make another layered jam I’ll put the darker jam on top. Blueberry and peach would be another pretty combination, don’t you think? I’ve combined them in a jam before, but it might be pretty to separate them. Have you made a layered jam? I’d love to hear about it in the comments! 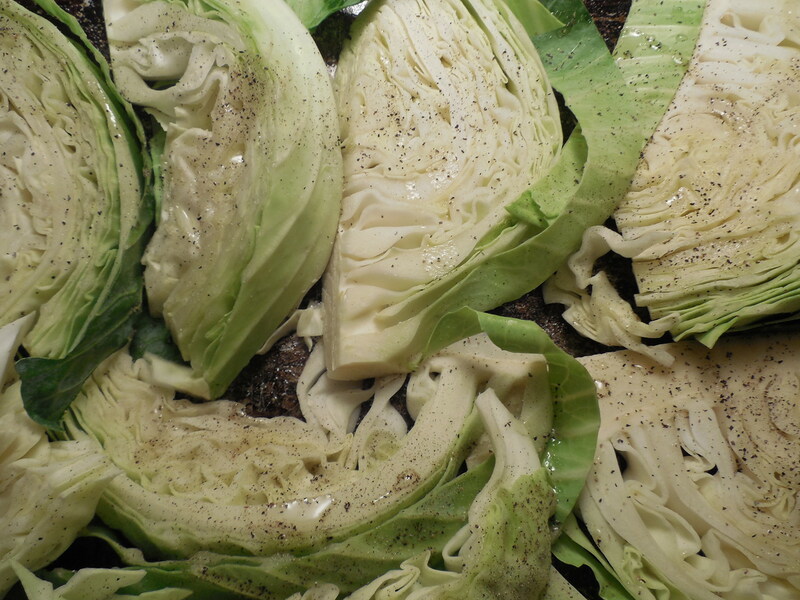 Summer is such a busy time in the kitchen. I’ve been working with blueberries, peaches, and figs are next!